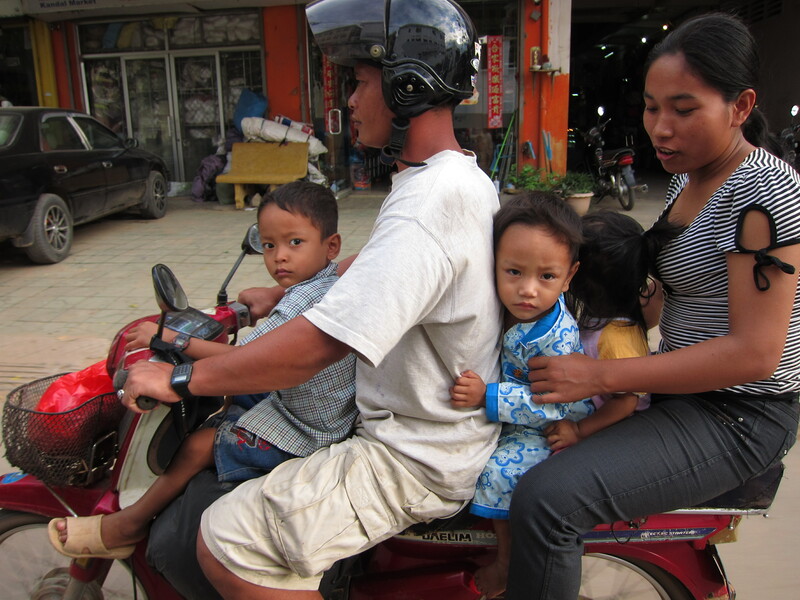 Women go to great lengths to cover up from the sun in Southeast Asia. It’s not unusual to see someone wearing a mask, hat, long sleeve shirt, gloves and long pants while picking rice in sun so brutal that in shorts and a t-shirt I’m sure I can feel the sun’s rays literally burning my skin. From what I understand, the sun isn’t reserved for the summer either. They live with it’s scorching power year-round. 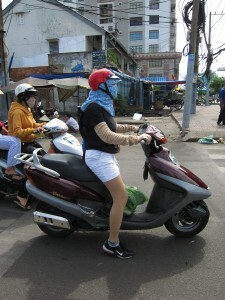 Covering up happens in all the places we’ve visited, but here in Vietnam it does seem a little more extreme. 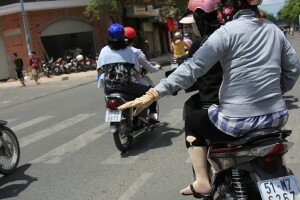 Armpit-length skin colored gloves and leggings are donned as people get on motor bikes. Masks are worn that can make you feel like armed robbers are wandering the city. Here, in Nha Trang, the beach is deserted during the prime sunbathing hours of 10 am to 2 pm. But as soon as 3 or 4 pm rolls around, it’s packed. While their aversion to sun is good anti-cancer behavior, from what I understand, their motivation is vanity driven by class consciousness. The darker your skin, the lower your status, because it’s reflects a life working in the sun. According to Lonely Planet, it’s a great insult to compliment a person’s tan and complementing the lightness of a person’s skin will win you favor. I haven’t tried it out. It’s hard to buy any skin product here that doesn’t have a whitening agent, that includes sun screen. See Sasha’s post from Singapore on the whitening advertisement we saw. I think about white Americans laying out in the sun at every opportunity, paying to go to a tanning booth or spray-on tans. Models in advertisements are tanned and the definition of vacation, according to Corona at least, is lying on a beach soaking up some sun. I wonder if white America values tanned skin, because it indicates greater leisure time and, in turn, higher status. While there are clear exceptions among minorities in the States, my wife included, it’s strange to witness one culture work so hard to keep their skin light, while another works so hard to make it darker. As for myself, I have a tan any American farmer would be proud to have. Josh!! I LOVE your stories on this adventure.